The federal Liberal Government plans to dredge the ecologically sensitive Fraser River estuary and build a 460-acre artificial island terminal and widened causeway. Is it being built to store and export Trans Mountain Pipeline’s Alberta bitumen? 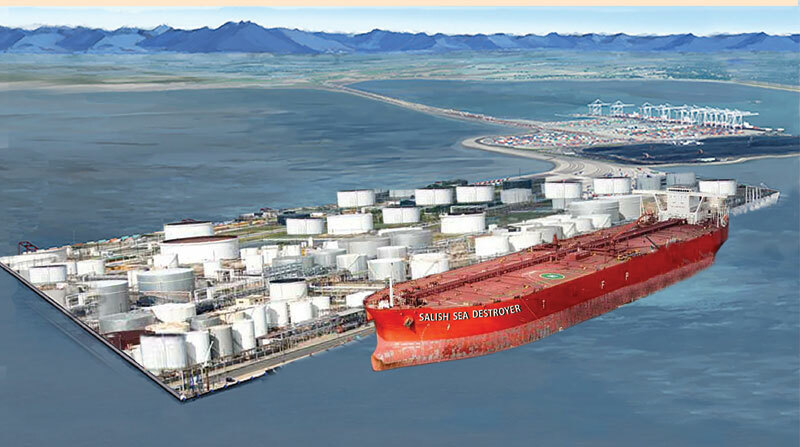 Could the hidden agenda for the new Roberts Bank Terminal 2 be to supplant the Westridge Marine Terminal in Burrard Inlet where public controversy has focused on the dangers of increased tanker traffic, especially through the hazardous Second Narrows past world-renowned Stanley Park? The Terminal 2 Island will be the size of 348 football fields made from 18 million cubic metres of likely-contaminated fill. Combined with the existing 210-acre Deltaport container terminal and the 198-acre Westshore Coal Terminal, the terminals will be 868 acres, almost as big as 1001-acre Stanley Park. Plans for Container Terminal Morphing into Oil Terminal Originally, the Port of Vancouver stated the purpose for Terminal 2 was “to meet increasing forecasted demand for containerized trade on the west coast of Canada.” But new facilities underway in Prince Rupert and Vancouver will provide all the container capacity needed for decades. Additionally, most of the growth in west coast container import shipping is for U.S-bound containers. This business could easily be lost to U.S. ports. Do Canadians seriously want to destroy the Fraser Estuary to funnel U.S.- bound containers through B.C.? Luckily, federal bureaucrats figured out another use that fits right into the plans of the Trudeau government. But first, they had to change the Terms of Reference and the Purpose for Terminal 2. This was done at a public meeting on January 30th, 2019 where the Port of Vancouver removed container business and announced that Terminal 2 was: “to accommodate future growth in trade on behalf of Canadians.” At the same meeting, the Environmental Assessment Review Panel announced changes stating they were not required to consider if Terminal 2 is needed. Also, they could specifically consider only Terminal 2 without considering container terminals that might better serve the west coast. This contravenes the Canadian Environmental Assessment Act which requires consideration of alternative locations for a project. Ironically, the Port of Vancouver conceals the slower growth of the Vancouver container business with statistical reports that include the faster growth at Prince Rupert. Yet the fact that Prince Rupert is already handling the growth in B.C.’s west coast container business is not allowed to be considered in this environmental assessment. The federal government can flatly deny plans to use Roberts Bank as an oil terminal because the environmental assessment process is for a new container terminal with three shipping berths. Once approved and built, the environmental damage will have been done. Then, there can be another environmental assessment for shipping oil from Terminal 2. A federal environmental assessment has been underway for 6 years with final public hearings in May. Unfortunately, Terminal 2 is being assessed under Harper Conservative’s gutted environmental protection laws. Under their “Real Change” plans, the Trudeau Liberals promised to restore and reinforce environmental protection but they have not delivered. They want Terminal 2 and apparently don’t care about the deadly impacts. Pollution, ship collisions, noise interference, and low availability of chinook salmon are killing Southern Resident Killer Whales and preventing reproduction. Listed as endangered under Canada’s Species at Risk Act, cumulative impacts from Terminal 2 could mark the death knell for the whales due to the loss of critical habitat, port and ship emissions, and deadly oil spills. Twenty three species of wildlife listed under the federal Species at Risk Act are known to exist within Terminal 2 and its shipping area. The Fraser estuary supports the highest concentration of migratory birds in Canada—hosting up to 1.4 million during peak migration periods. More than two billion juvenile salmon spend some weeks or months in the Fraser estuary before beginning their ocean journey. An estimated 20% once survived and thrived in the ocean to return and spawn in the stream where they were born. Now, it is estimated less than one percent return. But still, the Fraser River system is one of the greatest salmon producers on earth. 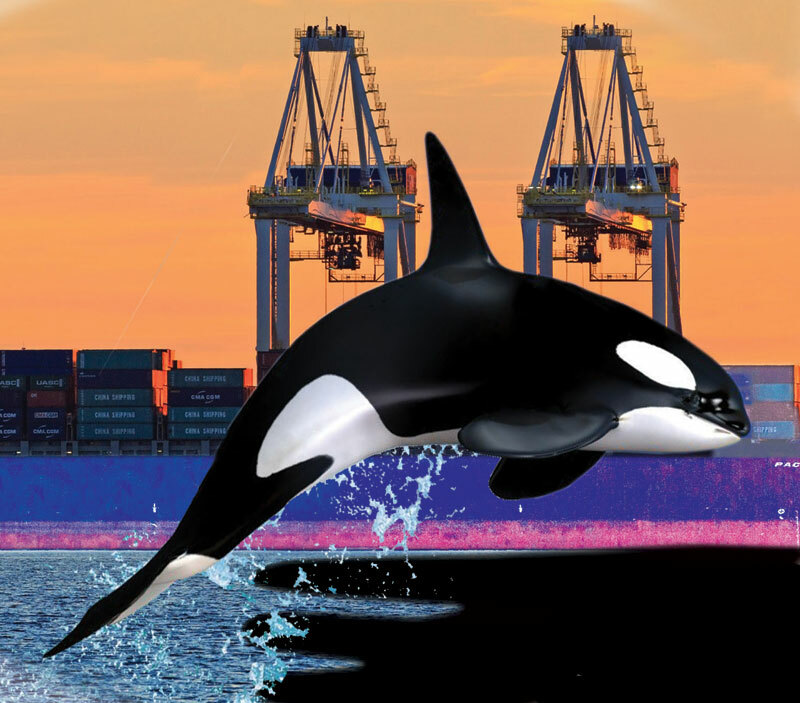 Reports by Government scientists reveal serious cumulative impacts of increased shipping in the Fraser Estuary and the shared Salish Sea which support human health as well as internationally-significant wildlife. Ecosystems will be destroyed and altered from dredge-and-fill, anchorage sites, spills, disposal at sea, noise, light, and air pollution. Killer toxins such as PCBs and PBDEs will enter the food chain affecting humans and wildlife. Large quantities of air pollutants in the form of sulphur and nitrogen oxides and particulate matter will lead to adverse health impacts including premature death, cancer risk, respiratory illness and increased risk of heart disease. The Review Panel, appointed by the Federal Government to oversee the environmental assessment of the proposed Roberts Bank Terminal 2 Project, is rushing its incomplete environmental assessment of the proposed project to Public Hearings to start on May 14, 2019, in Delta, B.C. Trudeau’s team is pushing for approval of Terminal 2 before the Federal Fall Election ignoring the fact that the public, including Indigenous groups, are on record stating insufficient information, missing information, limited scope, and failure to address cumulative effects. Members of the public are expressing shock at interference from the Trudeau Liberal Government as Catherine McKenna, Minister of Environment and Climate Change, announced changes to the Terms of Reference on March 8th when it is too late for the public to have meaningful input. Deltaport Container Terminal is adjacent to the proposed Roberts Bank Terminal 2. The Deltaport Operator, Global Container Terminals Inc. (GCT) has filed two Applications for Judicial Review of Terminal 2. GCT claims the Project was rushed to Public Hearings without complete information. They claim the Port of Vancouver and Government of Canada have not complied with the legal requirements of the Terms of Reference. The Deltaport operator has been betrayed by the Port of Vancouver which manages their lease. If Terminal 2 proceeds, the container competition will lead to job losses at Deltaport but the Port of Vancouver doesn’t care about its tenants. It just wants more property as it now operates to build up real estate assets with high returns instead of managing shipping and trade for the benefit of Canadians. The Port of Vancouver is a rogue organization exploiting Canadian assets with no oversight. The Port of Vancouver has submitted so-called scientific reports but they are paid by the port and are not peer- reviewed. At the same time retired civil servants reveal that reports by government scientists have been stalled , vetted and altered by bureaucrats in Ottawa. There are strong indications future plans for Terminal 2 could be for Trans Mountain Pipeline Oil or for export of LNG from the expanding Tilbury LNG plant 21 kilometres up river from the Fraser Estuary. The Canadian Environmental Assessment Agency has made it effectively impossible for the general public to make submissions to the Public Hearings for Roberts Bank Terminal 2. To offer your opinion, go to the website of Against Port Expansion in the Fraser Estuary: www.againstportexpansion.org. Click on ‘Have Your Say’, Scroll down and click on “send email” Then send an email with your comments and concerns. The organization will submit your comments to the federal government. Let them know what you think about the process and the proposed Terminal 2 project. Politicians, federal bureaucrats, and the Port of Vancouver want this terminal and have worked hard to avoid a credible environmental assessment of all the cumulative effects of projects and related infrastructure that have been built since the building of the Tsawwassen Ferry Terminal in 1958. This has resulted in years of degradation of the Fraser Estuary despite numerous reports warning of significant environmental damage. So they are delighted with the National Energy Board’s (NEB) approval of the Trans Mountain Pipeline on February 22, 2019, in spite of acknowledging significant adverse environmental effects. Shifting the Trans Mountain Pipeline’s export facility to Roberts Bank could deflect the opposition of the Tsleil-Waututh First Nation, whose main reserve lies directly across Burrard Inlet from Westridge Marine Terminal. It could also deflect the opposition of the City of Vancouver. Maybe Trudeau’s pet project fiasco would be salvaged. On the pretext of needing a new container terminal, the Federal Environmental Assessment review for Terminal 2 Project is on fast-forward and now is almost completed. If Terminal 2 is used for containers, it will double the congestion, air pollution, and noise. Truck traffic will increase from 4500 truck trips daily to 9,600.